All right, the first thing you’ll notice upon opening this mini-dungeon would be that it’s twice the usual size – that means we get 4 pages of content instead of the usual 2 pages. Mini-dungeons are super-condensed scenarios that deliver a small adventure. As such, I am not going to expect epic storylines or the like here – I’m rating these according to the virtues they display within the confined space available. The second thing you’ll notice would be the evolution regarding layout: The pdf is laid out in the same way as the massive Mini-Dungeon Tome: Color-coded for swift reference. Statblocks are not included, and instead, the module links towards the respective SRD-page with hyperlinks. This particular mini-dungeon has no read-aloud text, but it does offer a nice, full-color map as well as a piece of quality artwork. Somewhat puzzling to me would be that there, as per the writing of this review, is no high-res jpg.-map included for VTT-play. In this particular case, that is not as big an issue as it would be for most mini-dungeons, though. The module is intended for 3 – 4 PCs of levels 6 – 8. This review was requested to be moved up in my reviewing queue by one of my patreons. As always, this is an adventure-review, and as such, the following contains SPOILERS. Potential players may want to skip ahead to the conclusion. All right, only GMs around? Great! Ochre Grove is a small village, with the Rusty Mist Distillery, owned by the Cornelius family, being its main source of income. This changed somewhat when Hammond Gresham founded his own distillery and began cutting into Victor Cornelius profit margins – and as such, Cornelius presented forgeries, attempting to evict Hammond. Revealed as forgeries, the claims were dismissed – and Hammond still disappeared soon thereafter. In the absence of an heir, Victor Cornelius evicted Margaret, the mistress and sister of Hammond’s late wife from the property in retribution for her accusations of foul play. Unfortunately for all involved, Margaret is a sorceress (oni statblocks are used) who proceeded to bide her time, finally managing to summon both an incubus (nice touch for 5e re enemy choice!) as well as the spirit of her erstwhile lover. She plans to have Hammond’s spirit take care of Victor and his son, while she kidnaps the Cornelius daughters to sacrifice them and invoke a curse upon the land. It is into this tangled web of deceit and vengeance that the PCs stumble – and while the village may seem quaint, this quickly ends when the grain dust in the Cornelius distillery’s bins explodes! The PCs and villagers hurry to the site, but the only bridge crossing the stream has taken serious damage and has been destroyed, with only the framework offering for a rickety means of crossing the stream. Editing and formatting are very good on a formal and rules-language level. Layout adheres to clear and nice two-column full-color standard, and the pdf has no bookmarks, but needs none. Cartography and artwork are in full color and rather nice. Justin Andrew Mason provides a nice, brief sidetrek here – the instance of a branching path is a pretty sweet inclusion for such a small module, and while the revenge-yarn featured herein isn’t exactly groundbreaking, it doesn’t have to be. The 5e-version, to me, actually works a bit better than the PF 1 version; if you have the luxury of choice, then this is the slightly superior version. As a whole, this is a fun sidetrek and thus should be considered to be worthy of a final verdict of 4 stars. You can get this fun little scenario here on OBS! Unfortunately for all involved, Margaret is a sorceress (no links for this lady) who proceeded to bide her time, finally managing to summon both an errinyes (nice touch – female retribution association) as well as the spirit of her erstwhile lover. She plans to have Hammond’s spirit take care of Victor and his son, while she kidnaps the Cornelius daughters to sacrifice them and invoke a curse upon the land. Justin Andrew Mason provides a nice, brief sidetrek here – the instance of a branching path is a pretty sweet inclusion for such a small module, and while the revenge-yarn featured herein isn’t exactly groundbreaking, it doesn’t have to be. As a whole, this is a fun sidetrek and thus should be considered to be worthy of a final verdict of 4 stars. The third DCC-Halloween module clocks in at 24 pages, 1 page front cover, 1 page editorial, ½ a page SRD, 1 page advertisement, 1 page back cover, leaving us with 19.5 pages. Unlike previous Halloween modules, this one is laid out in standard size, so it’s actually a tad bit longer than the two shorter ones I’ve covered so far. But does quantity mean quality here? Let’s take a look! This review was requested and sponsored by one of my patreons, to be undertaken at my convenience. It should be noted that the final ½ page of the module contains a couple of pregens, in case you have casualties. The module is intended for 4 – 6 first level characters, but it may also be run for quadruple that number 0-level funnel characters. Indeed, I think this may work better as a deadly funnel or one-shot. I strongly suggest the party to include a character with the Animal Trainer occupation, and I REALLY recommend the group to be able to cast Comprehend Languages. You’ll see why later. However, before I go into the details, I will pronounce the obligatory SPOILER-warning. The following thoroughly discusses the module. As such, only judges should continue reading. All right, only judges around? Great! So, this is, as the module acknowledges, a kind of homage/riff on “Shadow over Innsmouth.” It begins in the backwater place named Black Sand Port, where wreckage has a couple of strange survivors of Fu-Lamian descent wash ashore. The greed of the burgomaster’s spurred – and hopefully that of the PCs, as the survivors tell them about Princess Kaeko, who had been aboard their crashed ship. A list of 18 rumors is provided for the region. It is assumed that the PCs basically steal a boat and get it towards the infamous coral reef known as the eponymous “Devil’s Reef” – and there is a chance to save some survivors. Making their way past the saltwater graveyard created by razor-sharp corals and the sharks that haunt these waters, the PCs enter the jagged landscape, where the boat may take damage if the PCs don’t get the pattern of reefs. A failure damages the boat. How much damage can it take? Well, the boat doesn’t get stats when it’s acquired – these are hidden in a somewhat counter-intuitive manner in the first encounter potentially featuring it. The coral island does come with random encounters that center mostly on deep ones. There is a deep one caster here with a name, and the island otherwise is pretty brief; there is an onyx pillar topped with a ruby. Touching the pillar shocks you; shooting at the ruby will the pillar fire a lightning bolt at the offender. Hitting the ruby with a ranged attack has a small chance to knock it loose, and touching it after that may provide a flash of insight that is one of the obtuse ways to solve a bottleneck of the adventure – but more on that later. It would make sense for the PCs to explore the wrecked ship, the Royal Dawn, and the brief exploration of the ship wreck is indeed interesting: Provided the PCs haven’t yet experienced it themselves, they will have heard about it/deduced it: oddly, proximity to the island and exploration seems to make the respective persons undergo a kind of transformation – in 8 steps towards a Deep One Hybrid, with step #8 equaling game-over. This is per se a solid angle. Anyhow, the Royal Dawn shows serious signs of struggle, and exploring it may put the PCs into a dialogue with a statue of Farrin-Shae, the guardian demoness of sorts of the vessel, who might well proceed to animate the slain on board into devil-like looking things that actually are undead. The true treasure of the vessel, though, is actually something the PCs may well slay – the abducted princess had a pet, a so-called psi-spider, and its touch/attempt to communicate causes damage. Animal Trainer AND resisting the impulse to slay it, is one thing that will make the finale/aftermath much easier – provided the critter lives through the module, that is. Anyhow, back to the isle, as ultimately, exploration of the wreck could conceivably be skipped: On the island, there is a set of lavishly onyx double doors: A piece of b/w-artwork shows a character being fried by them, and the choice to make this artwork is utterly puzzling to me. Why? Well, the door has two dials that may be moved in one of 5 positions. Can’t read Aklo/don’t have aforementioned spell? Well, have fun trying to frickin’ brute-force the doors and being shocked all the time. Two of the runes, provided the PCs can read them, correspond to Celaeno and Polaris. Okay, so what? This looks like a puzzle that was supposed to feature a visual representation…you know, like quite a few Goodman Games DCC-modules offer? Instead, we get a solid, but ultimately useless artwork. Oh, and there are TWO such doors in the module. The second one has a different combination! The least frustrating approach here is indeed when the players have not learned from being zapped by aforementioned ruby and knocked it down – then, at least they know the combination. This should have been a puzzle, and instead is an exercise in frustration and trial and error. That happens twice. Blergh. Beyond the doors lies the truth, the reason for the mutation-impulse that has taken a hold of NPCs and PCs alike: The PCs stumble into an Elder Thing lab, where a star-spawn of Cthulhu is kept trapped. Its presence sends a telepathic impulse to the DNA of creatures nearby. But I’m getting ahead of myself: The PCs first have to slog through 3 rooms that are thoroughly linear: A slide must be passed, then a couple of deep one hybrids and a shoggoth await the PCs. And this is where I uttered an exasperated “Really?” – the shoggoth is strong, but still utterly pitiful regarding its power, considering that it’s a frickin’ shoggoth. And, in a grating deviation from DCC-design aesthetics, it can’t be bypassed, has no means to make it easier, nothing to reward smart players. Oh, and running past it is no option. The PCs first have to brute-force the second frickin’ dial-door to proceed. Instead of rewarding capable players, the module suggests wounding the shoggoth. *sigh* Why does it have to be a frickin’ shoggoth? In the halls beyond that, the PCs can interrupt the hibernation of elder thing scientists and pick them off one by one. Yes, this is about as fun and as redundant as it sounds. The hibernation cells, btw., have a mechanism that locks and floods them. And the module gets drowning rules as established in DCC wrong. How do you prevent drowning? Well, obviously with Reflex saves, right? Because agility totally translates to how long you can hold your breath? WTF. How this one could slip past editors is puzzling to me; it contradicts how drowning works. The finale has the PCs fight more elder things, fiddle with a console whose functionality they can’t deduce, and thus release one of three tanks – either mad Deep Ones (including the princess),a dead star-spawn, or an alive one. It’s totally luck based what happens. The module has a couple of promising notes for elder thing tech and living glowbug critters…but guess what elder thing tech does? They’re spells in a can. I kid you not. Oh, and good luck if the psi-spider’s not with the PCs – it can snap the deep one corruption out of the princess. Te star spawn of Cthulhu has btw. 14 hit points, and mundane weapons do minimal damage. It’s wounded by experimentation, but still. That’s just sad. Editing and formatting are not on the level I’ve come to expect from Goodman Games. On a formal level, the module is tight, but rules-sequence and integrity is pretty compromised in a couple of cases, and there are instances of spells not properly formatted. Layout adheres to a two-column b/w-standard and the pdf sports nice b/w-artworks. Puzzling: The module’s pdf has no bookmarks, which constitutes a comfort detriment! The cartography per se is gorgeous, but the wreck’s map has no grid, and we do not get player-friendly versions of the maps. Are you really, really tired of the Cthulhu-mythos? Do you want to complete the process by which it’ll lose any form of coolness and horror? Do you want to complete the transformation of the creatures into just another type of critter to be slaughtered by your local MurderHobo Inc.? Then this is the module for you! After this, neither shoggoths, nor star-spawn, will ever elicit more than a yawn from your group. It’s also simply badly-designed, blending bad Cthulhu-scenario design with obvious issues with the DCC-rules and design aesthetics that I love so much. There is no rewarding the players for smart playing here – it’s all up to chance and trial and error, ostensibly justified by mythos being weird in the time-honored tradition of bad Cthulhu-scenarios. 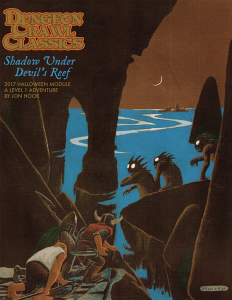 John Hook’s “Shadow under Devil’s Reef” is not even remotely creepy and feels like a paint-by-the-numbers standard pulp-Cthulhu scenario of the weakest sort, lacking the Appendix N-flavor and heavy metal aesthetics that I expected to see. You see, I didn’t even expect this to be creepy in any shape, way or form. It’s not, by the way. Not at all. However, it fails miserably at making the mythos-creatures feel cool, it fails at blending DCC’s heavy metal-influenced aesthetic of fighting against…THINGS with the mythos. It also fails as a spoof. It’s not funny, nor badass. Know who does the whole angle better? Pretty much everyone. For horror, Call of Cthulhu and Trail of Cthulhu are better. 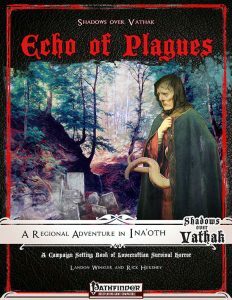 For (dark) fantasy adventuring, Paizo and Kobold Press have vastly superior modules, and Fat Goblin Games’ “Shadows over Vathak” setting actually manages to craft a fantasy world that is heavily-influenced by mythos aesthetics without being cliché and redundant. Oh, and if you really want heavy metal aesthetics and weirdness, I’d strongly suggest taking a look at LotFP’s Carcosa or Venger Satanis’ “The Islands of Purple-Haunted Putrescence”. Heck, Venger’s early work, while a bit rough, successfully manages to blend the “OMG, how cool is that”-metal aesthetics, horror and even funny bits and create a cohesive whole. I’d take his flawed, but inspiring “Liberation of the Demon Slayer” over this bore-fest any day of the week. This sounds harsh, but I was really, really pissed off by this module, by how utterly uninspired and flawed it is. I honestly feel like I wasted my money with it. In stark contrast to the previous Halloween adventures, this is not a dip, but a free-fall regarding quality. My final verdict will clock in at 1.5 stars, mainly due to Goodman Games’ high production values, and while I briefly contemplated going 1 star due to the lack of bookmarks and player-friendly maps, I will round up due to in dubio pro reo. Only buy this if you’re a completionist. If you’re willing to convert modules, there are vastly superior offerings pretty much everywhere. You can get this adventure here on OBS. Don’t say I didn’t warn you. The second Halloween adventure for DCC clocks in at 22 pages, 1 page front cover, 1 page editorial, 2/3 of a page SRD, 1 page back cover, leaving us with 18 1/3 pages of content, so let’s take a look! It should be noted that this adventure is laid out in 6’’ by 9’’ (A5), which means you can fit up to 4 pages on a sheet of paper when printing this. This review was requested and sponsored by one of my patreons. Unlike the previous Halloween-module “They Served Brandolyn Red”, this one begins at the lofty level of 6. It is strongly suggested to have a well-rounded group of characters in order to survive this one. The module comes with plenty of read-aloud text and provides some guidance for conversations. This being an adventure-review, the following contains SPOILERS. Potential players should jump ahead to the conclusion. All right, only judges around? Great! So, the theme of Erblast, i.e. a form of inherited sin that is passed down through the generation, is a potent theme, and one that can have serious repercussions ina fantasy context. Turns out that, unbeknown to the PCs, some ancestors of theirs during the millennia have vanquished the eponymous Sempstress, an entity of pure horror. Said entity has trailed their bloodlines throughout the aeons…and now it’s time for the PCs to pay for the “sins” of their ancestors. And there is nowhere to hide. Okay, we have to talk about an obvious inspiration here: the dungeon the PCs explore, the prison/fortress of the mighty Sempstress, is nothing short of a genius riff on Silent Hill’s Otherworld. Instead of aesthetics based on metal, rust and flesh, mirroring the dystopian industrial complex and related visions, this module instead takes a step back and basically transports the Otherworld concept one step back through time, tapping into cultural anxieties of stitched together corpses and the like. A strong Frankenstein angle, a realization of church-propaganda horror-scenarios, comes alive within this place, all while retaining the central leitmotif of fear of the flesh, of disfigurement, of bodily integrity. Breaching the skin of the pulsing, organic and disgusting foyer, the first room of the “House of Tattered Remains”, drives that home from the get-go, with bodily fluids congealing into a twisted, disgusting thing. Quoting Tuzun Thune, windows to elsewhere may be found…and the monsters are so disturbing, they might as well have been taken from Silent Hill, Rule of Rose, or similar games: We have spiders puppeteering corpse-marionettes on an endless-seeming staircase. We have timekeepers that ask for a moment – and if the PCs answer in the affirmative, that’s just what they steal from their minds! Heck, these nasty buggers may strip an unlucky PC of all experience, reverting them to their humble beginnings! This is, difficulty-wise, one of the most brutal DCC-modules I’ve GMed, but it, like all good, hard modules, earns it: The monsters all have a trick (or two) that rewards clever players over high rolls: Observation, smarts and the like are just as important as PC-brawn here: The timekeepers, for example, have a pretty hefty Achilles’ heel; the spider-like spuppeteer-spiders can be noticed, etc. Traversing a bloody ballroom, finding a room where the PCs are threatened by regression to an infantile state, avoiding the sempstress’s scrying devices…the exploration of this nightmarish realm is just fantastic and evocative. It should also be noted that a gigantic, horrid blob may well be the impetus for a TPK – the “Custodian of Parts”, erstwhile servant of the Sempstress, may actually be the best chance the PCs have to find something that will give them a much-needed angle against the deadly creature – provided the PCs play their cards right and don’t antagonize the…thing. They will need to find “The Bright” – which is somewhere in vats of eyeballs, slimy mucus, marrow…and here, the module becomes meta in an amazing way: It suggests peeled grapes, etc., the creation of an old-school “Halloween Feelbox”…and to have the players grasp for “The Bright”, hidden somewhere in the icky things. So turn of the lights, and have fun! Did I mention that the metaphysical house’s attic contains animated flesh-dresses, gruesome perversions of the bridal gowns many of us have seen up there, collecting dust? And did I mention that the Sempstress is really tough, that players that don’t play their cards right, will die horribly in the finale? If they get to life that far. You see, there is one more aspect about this module that I love: Do you know the kid-horror-movie Caroline? How it can be twisted and disturbing for parents and adults? That’s the final blending of ideas here: The transformative aspect. Instead of a mundane sanity engine, or using the corruption-engine, exploration of the house and fighting its denizens will put the PCs eye to eye with the Sempstress’s horrible power of “Unraveling” – they find tiny stitch-marks on their skin; clothing and body fuse, skin becomes translucent, one eye become a doll’s eye or a button-eye…their very presence herein not only subverts their sanity, it actually corrupts their bodily integrity, even when it comes to being…well, organic. And yes, many of these effects do have mechanical effects. When their bodily stability has been reduced to zero, they unravel, like a piece of abruptly unwoven cloth…for a fate that an enterprising judge will make most fearsome indeed! Editing and formatting are very good, bordering on top-notch. The rules-language is super-tight, and I noticed no undue accumulation of glitches of a formal nature. Layout adheres to a 1-column b/w-standard with amazing and creepy artworks. The 2 pages of maps are beautiful, b/w,…and lack player-friendly versions, which is a big downside as far as I’m concerned. Pity that players won’t get to see it. The pdf comes with basic bookmarks – they could be more detailed. Michael Curtis delivers in frickin’ spades in this adventure. The breakdown of physical borders and rules, courtesy of the nature of the dungeon, also provides a genius justification and carte blanche for an eclectic series of encounters that still makes sense; the different leitmotifs and themes blend together in an ingenious way that is greater than the sum of its parts: While the comparison to Silent Hill remains most apt in my book, it should be noted that the module has its own identity: Its blending of early/pre-industrial revolution anxieties, childhood fears and Otherworld (-ly) horror runs a the thin tightrope with panache aplomb, generating a vision that is slick, twisted and frankly glorious. I honestly wished that this had been a massive boxed set depicting a much larger realm, but one may dream of horrific realms for DCC, right? 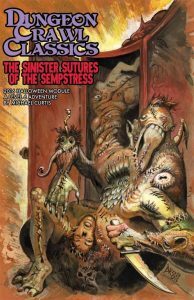 This adventure, in spite of its copious Appendix N/Sword & Sorcery quotes, which clearly designate it as having the DCC-style, actually achieves the goal of being a HORROR-module. It is so good, so resounding a success in its atmosphere and flavor, that I’d recommend it sans hesitation as a module that is amazing not only for DCC, but also for other rule-sets. The adventure deserves being experienced and played – in spite of its brevity and the lack of player-friendly maps, this gets 5 stars + seal of approval. It’s one of the best horror modules I’ve analyzed in the last couple of years. If you enjoy horror, don’t miss this short, but oh-so-sweet gold nugget of grimey, sewn-together, gory madness! You can get this delightfully icky, amazing horror-module here on OBS! Venger has announced the final Alpha Blue kickstarter – and at this point, I assume you know what you’re in for: 70s/80s scifi-parody-sleazy of the most bonkers of styles, with a suitable beer-and-pretzels, rules-lite system and dressing tables galore! You can find the kickstarter here – but hurry! It’s only running for about a day, so decide quickly! You can find the fully funded KS here! The Frogs have been trying mini crowdfunding campaigns on IndieGoGo, and this would be the second one. 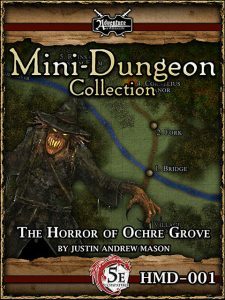 The module is available for 5e, OSR (Swords & Wizardry) and PFRPG, and I’ve heard through the grapevine that it’s a kind of feasibility-test…so if you’re one of the folks that complained about Frog god Games offering no PFRPG 1 versions anymore for their latest KS, well, here’s your chance to show support. The campaign has only 2 days let to you – you can find it here! All righty, back to the review-mines! This horror-adventure clocks in at 32 pages, 1 page front cover, 1 page editorial, 1 page ToC, 1 page advertisement, 1 page SRD, leaving us with 27 pages of content, so let’s take a look! It should be noted that the pdf includes 6 sample pregens, who, power-level-wise, are approximately on par with one another. These use Vathak-specific rules, obviously, but all that you need to run them is included within this module. The pdf does feature copious amounts of read-aloud text, so if generating a proper atmosphere is not your strong suit, this has you covered. All righty, this being an adventure-review, the following contains SPOILERS. Potential players should jump ahead to the conclusion. Only GMs around? Great! We join the PCs as they are on the road through the regions where the fell Plague of Shadows once ravaged the lands, towards the former capital of Ursatur, and they are escorting the romni trader (lavishly-illustrated with a stunning artwork) Nuri Brovna, and they’ve been on the road for some time. The pdf does provide a couple of hooks here for your convenience. Anyways, after a flavorful introductory text, the adventure proceeds to confront the PCs with a cadre of bhriota raiders – these guys attack the wheels, and the module uses an abstraction here, telling you to track the number of attacks executed against the wheels. While I totally get the narrative importance of the state of the wagon, I do think that providing stats for the wagon would have been the more “Pathfindery” thing to do here. It doesn’t negatively impact the adventure, but from an aesthetic point of view, it’s something that bugs me. After driving off the raiders, the PCs will have a chance to test their skills and problem-solving in a skill-challenge of sorts, wherein they extract the wagon from the raider’s pit. Tracking down the raiders, now or later, to their camp will be appreciated by the locals, just fyi. Arriving at Jelsana, the wagons and PCs are inspected by locals muttering under their breath about diseases before being allowed to enter the village, where furtive and fearful gazes are sent towards the PCs by the funerary-garbed locals. A brief run-down of the village and its movers and shakers is provided for your convenience, and the movers and shakers have small quests for the PCs, which can be used to gain favor with the respective important NPCs. The truth of the subject matter can be deduced by various means by the PCs: The bones sold to father Heinrich are harmless, but the flesh that the smugglers removed from the excavated mass grave’s victims…well, it’s not, Sharing this with the public in a convincing manner will see the smugglers burned alive, with a climactic battle purely optional! Personally, I think this is amazing: The module does not throw yet another tentacle thing as a boss at the PCs, it is a tale of paranoia and violence, of greed and human frailty, and the climax, the burning, can make for a great tonal reinforcement that serves to drive home the themes and feeling of Vathak. Editing and formatting are good on a formal and rules-language level; I noticed a few minor mistakes, but nothing serious. Layout adheres to Vathak’s amazing two-column full-color standard, and the pdf sports really nice full-color artworks. The module comes fully bookmarked for your convenience. Okay, veterans of my reviews will have deduced what the one thing is that I don’t like about the adventure. It has no maps. Not for the road-side ambush (okay, we can make those), but also, alas, not for the village and the places within. There is a map for the region, taken from the Vathak-sourcebooks, but that’s it. This means, ultimately, that the village feels slightly less defined than it should be, a bit opaque, if you will. Granted, it is an issue that is easy enough to remedy with the copious amounts of villages and their maps from e.g. Raging Swan Press’ village backdrop-series, but yeah…that’s a downside. So yeah, I enjoyed this more than I thought I would! My final verdict for this one will be 4.5 stars due to the minor hiccups and lack of cartography, but I will round up due to in dubio pro reo. You can get this unconventional adventure here on OBS! Missed the Ina’oth supplements? You can find the GM’s guide here, the Player’s Guide here! The massive (and really impressive!) Shadows over Vathak Player’s Guide can be found here! This is also part of a massive Halloween bundle, which you can find here! This RPG clocks in at 150 pages, 1 page front cover,1 page editorial, 1 page ToC, 3 pages blank, 2 pages of brief index, leaving us with 142 pages of content, laid out in 6’’ by 9’’ (A5), which means you can easily fit 2 – 4 pages on a sheet of standard paper. It should be noted that this game contains a ton of resources and supplemental material, but I’ll get back to that later. The rules-components and main meat of the supplement constitutes 78 pages, and genre-wise should by considered to be a story-game, i.e. it emphasizes cooperative storytelling over rules and emphasizes a shared narrative experience that is mostly beholden to dramaturgy. All right, that out of the way, let’s dive in! 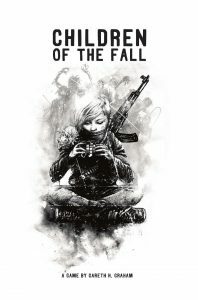 Children of the Fall is first and foremost a post-apocalyptical survival game, one wherein the dynamics of groups of children are explored. As such, it is important to note that a mature gaming group with similar tastes and taboos is something I’d recommend. While I can inflict, for example, really dark and messed up stuff on my players, because they’re my friends and I’ve known them for ages, I wouldn’t do the same for strangers. If in doubt, it may make sense to follow the advice of the game and use X-cards or similar signs to “pause” the collaborative game. Children of the Fall is intended to be GM-less, which means that everyone’s a player, and everyone’s in charge of a single character. Instead, every player around the table takes turns directing a scene that the players will engage with in-character. The claim of the book that GMless play prevents railroading is an obvious fallacy and example of the kind of opinionated designer-commentary inserts that I personally do not like, though the zero-prep aspect that is listed next (which imho is a significantly more important point!) very much holds true. Children of the Fall does not require players to prep for the game in pretty much any way. As far as scope is concerned, the game suggests that it works best for 4-6 session mini-campaigns, though it imho works just as well as a bleak one-shot, if everyone knows what they’re doing. The basic premise of the post-apocalpyse reminded me of the Veitstanz in the German cult roleplaying game “Engel”, in that, over the course of a short period of time, all adults began to succumb to something. In the case of this game, that something would not be a hyper-advanced disease (though it certainly can be that! )…but the outcome is what matters. The outcome, plain and simple, is that all adults became “The Fallen” – a cadre of bloodthirsty maniacs. “They never speak or blink…” though, with the latter, by necessity of biology, meaning that a supernatural cause must be involved. Otherwise, you know, their eyes would dry up. The Fallen are bloodthirsty and dangerous, grinning maniacally, and they are basically super-evil monsters. Think of them as rage-zombies minus decaying flesh, plus Joker-grin and you’ll have a pretty good idea of what they are. The process is ongoing, mind you: Between ages 16 and 18, everyone becomes one of the Fallen. How is humanity not instantly dying out? Well, the Fallen continue to procreate, and their kids, left by the wayside, are not immediately eaten, potentially allowing surviving kids to rescue infants and the like, though considering the challenges of raising a kid, much less the challenge of doing so in a post-apocalyptic world will probably in the long run eliminate the human species. Every players controls a kid between the ages 12 and 18, and since the event has wiped out all adults, a Cure, if there even is one, is not a feasible option; the cause of the apocalypse is not really noted either, which, while obviously providing a good blank slate to project stories upon, could be considered to be a weakness of sorts. Not every group consists of particularly original thinkers or brilliant, genre-savvy individuals, so having a few outré suggestions, or perhaps a generator of ideas for a cause, would have been nice. The world is pretty much one of scarcity, with resources a primary concern for all non-Fallen, and water, for example, becoming an ever-more sought-after commodity. The game begins with Session Zero, which experienced roleplayers can pretty much handle within 10 minutes or less, though the game does suggest taking 45 minutes to an hour. It is here we determine the time since the fall, with 6 days, weeks or months given as sample time-frames. The game has no classes or the like, instead using a so-called playbook as a character sheet – basically a bullet-points-kind of summary. The playbooks are included in the massive “resources”-section noted before, and the game, beyond the fully-filled out pregens, sports 13 playbooks in the back. These consist of 2 pages each, featuring 3 character questions that are customized for each playbook. Every playbook corresponds to a specific archetype, with the questions tailored to the respective archetype of the character. The troublemaker, for example, sports the question “Why do you never get caught?”, while the leader is asked “Who truly deserves to be the leader?” I am very ambivalent regarding these questions, as many of them are, quite deliberately leading, and while it is easy enough to replace them, it is one thing to be aware of. A blank sheet for more experienced players is included, and frankly, I’d strongly suggest using this one if you’re going to try to play for longer than a one-shot. The second page of the playbook-sheet is more interesting, providing a check-board of relationships, where you can fill out whom you’re jealous of, suspicious of, etc. This one is pretty handy indeed and allows for the quick and painless creation of social dynamics within the collective of characters, which is, unsurprisingly, known as “tribe.” The playbooks also sport a checkbox-series – “Trauma and Downfall.” A downfall is a narrative prompt for a negative event that can happen to the character during play, but before we get back to these, let us examine how the game is played. As mentioned before, the descriptive duties are shared in an alternating circuit, which means that one player is designated as the active player – the de-facto GM of the scene who describes everything. Said player MUST be in the scene. Now, system-immanently, such a rotating circuit works best for games wherein all players adhere to the “thespian” type of roleplayer, and this pretty much holds true for the whole game: Rules-lawyers and min-maxers who get their best kicks from rolling critical hit probably won’t derive much satisfaction from this RPG. I’d also go so far as to state that the game works best when all players share roughly the same skill regarding descriptions and roleplaying – it may sound snooty and snobbish, but I know for a fact that most folks I’ve ran games for aren’t as good a GM as myself, and particularly those who lack a lot of experience “behind the screen” may well find themselves to be in a position where the lack of narrative experience unintentionally generates railroads…but more on that later. Active players circle, and the other players, i.e. those that don’t describe/determine the scene, are basically the reactive players….or, you know, they’re just…”players.” Like in most RPGs. Anyhow, terminology quips aside, you’re probably asking yourself where the game comes in. Well, right now. Each player starts the game with 2 Story Points. During another player’s active scene, you can hand said player a Story Point to add a complication to the scene. “Complication” would here be the term to designate the form of any type of challenge, from snapping ropes to electricity turning off. Complications are resolved by rolling 2d6. Their values are added together, and the higher, the better. Sometimes, you get to roll 3d6 and choose the 2 best results. 8+ means that the complication is avoided, 7 or less means that it happens and that the active player marks down a trauma point. The introduction of a complication, which should be bad, but not catastrophic, and it may not influence a character’s actions directly. Once you have accumulated 3 trauma points, you erase them and mark down one of the downfalls in the playbook, each of which may only be selected once. The second core mechanic herein would be Determination. Each player has one point per session; they don’t accumulate, but they do refresh. This point may be used, you guessed it, to roll 3d6, discarding the lowest result, instead of 2d6. Thirdly, each player has a Helix point. These behave pretty much like Determination in that they don’t accrue, but do replenish between sessions. Helix points are basically “get-out-of-jail-free”-cards, in that they allow you to change any die roll, which means you can theoretically avoid almost any complication. Almost any? Well, yeah. If you rolled snake eyes (two 1s), you can only, RAW change the outcome of “any single die roll”…and that would, even if you change one of the 2d6s that came up as 1s to a 6, you’d still arrive at 7…and face the complication. Other players can explicitly not stack on top of another helix Point to cancel the effect just triggered…okay, but could they help out and mitigate a snake-eyes example? The rules, and the example provided here, alas, do not make that aspect clear. If your character dies, you either get a replacement, or may play the character in flashbacks when it’s your turn. Either is a choice, as the game has no game-over state. Dying is always a choice consciously taken due to dramaturgy. Thus, while players can potentially heap pile upon pile of complications on a given player, there is no “griefing” strategy that is particularly effective, and the player will have a metric ton of story points. This pretty much enforces that “what goes around comes around” and maintains a kind of balance, but also means that there is necessarily no excitement inherent in the rolling of the dice. All tension derives from the collective narrative, but there is no external threat, no loss- or win-scenario. In fact, considering the genre and type of game this wants to be, this is most assuredly a feature, and not a bug. Death being always a choice ties in with another aspect, and one of the most vocally recited (and valid) points of criticism for games that follow the collective narrative paradigm, namely that they are contingent on a constant breaking of immersion on a narrative level, as the implementation of complications, death etc. need to be renegotiated in the narrative. That being said, this issue is system-immanent and thus will not influence my final verdict. This already constitutes the entirety of the rules required to play this game, and the book then proceeds to give some pointers to play the respective different archetypes and the game, description, and mentions the importance of the “remnant” a cherished thing held on to from before the fall. These may or may not tie in with the final narrative aspect that needs to be filled in, namely the secret that every character has. The tribe is assumed to have a home-base, the Haven, which is drawn on a sheet of paper, with extensions that are decided upon/explored being noted down. The tribe-sheet notes a shortage or one thing, a surplus of other things, immediate and long-term threats and the hierarchy, which is likely to undergo changes – obviously. Missions, i.e. adventures, are supposed to be dangerous, exciting and the like, and several key questions allow the group to hammer out the details of a particular scenario, providing some guidelines there. Beyond the playbook and tribe sheets mentioned before, the resources section also contains mission sheets, tribe sheets, and a so-called campaign path, which suggests a sequence of theme-wise general tasks that the players can develop into missions, a rough skeleton of a campaign, if you will. We also get 4 pregens (with sheets already filled partially in) and a sample tribe-sheet, and the pdf concludes with 1 page design notes (and one page chapter-header). Editing and formatting, on a formal level, are surprisingly concise and well done – I noticed no serious accumulation of glitches. On a rules (few though there may be) perspective, I was a bit astonished to see an aspect that, in spite of being so extremely rules-lite, needing a clarification. Layout adheres to a one-column b/w-standard, and the pdf sports plenty of really nice, high-quality b/w-artworks. Utterly puzzling to me would be the absence of bookmarks for the pdf-version. In a book of this size, their omission constitutes a serious comfort detriment. Gareth H. Graham’s “Children of the Fall” has an amazing premise; post-apocalypse and kids? That is a recipe for interesting and diverse challenges, dark themes and an exploration of childhood and existential fears through a novel lens. The book works by juxtaposing the innocence usually associated with childhood by those more likely to succumb to nostalgia’s rose-tinted glasses than I am, with the abject and brutal nature of survival in a hostile world. There is roleplaying potential galore here, and Children of the Fall can work well as a story game. That being said, at the same time, I have a couple of issues with this book in its function as a story game. This may sound odd, but “Children of the Fall” may be too permissive in its focus for its own good. The Fallen are an interesting, if not particularly novel twist, but…well. That’s pretty much about it. “Smiling cannibal rage-zombie minus zombie” on its own does not necessarily make for a compelling narrative, and the book puts the burden of pretty much the whole world on the group: World-building, capabilities of the Fallen, etc. Now, this can work well, but it can also result in some unpleasant forms of tonal whiplash when the narratives envisioned by different players simply don’t mesh with one another. I maintain that providing different “play-modes” for the Fallen and more information on the actual world would have added greatly to the appeal of this game. Not every group will consist of brilliant auteurs with visions that complement one another, and having your great idea ruined by having horror-clichés spliced in by a less inspired player can be frustrating and to the detriment of the entire gaming experience. With the inclusion of optional leitmotifs and a kit to make them, the game would have a stronger common base-line. As an example: If we introduce “occult” as a common baseline, we could determine as a “rule” that, to just name one example, the Fallen may not enter uninvited into the place where someone sleeps. During a scene, a player could enter the complication that the person has to be sleeping *right now* – not an easy task when their fists are hammering at the door. In such a scenario, sedatives would become very valuable…and so it goes. The Fallen in such a scenario could also have magical abilities. If they’re infected humans, they could have heightened senses…or behave like the cordyceps-infected beings in “The Last of Us” – blending these in a viable form that satisfies all participants, though, would be hard. In short, a couple of template leitmotifs/global rules for how the world operates would have been helpful. A list of childish concerns and behavior patterns, some flaws and talents – nothing that *needs* to be strictly codified, but any form of optional detail would have enhanced the value of this book as a DIY-kit. My second major criticism pertains that the system as presented herein is always a zero-sum game that, in a for me puzzling manner, fails to address the narrative potential of the most important “character” of the whole game: The tribe! All complications and story points spent only pertain, as written, the individual player characters; since death is optional and since story points are essentially traded around, the central tension of the game derives from the interactions of players that complicate the lives of each others PCs, while the characters themselves trade spotlights. In short, the central narrative tension forms between player characters and players due to different reasons, creating a kind of narrative distance/disjoint. In an out-of-game context, this is subsumed in the experience of the tribe as the gaming group; but what about in-game? The concept of the tribe and its importance is acknowledged in the questions and potential traumas of the respective playbooks, but as itself, the tribe is just a backdrop, a name without substance, when it would have offered the most -rewarding aspect of the game’s narrative. The reconciliation of a kid’s intrinsic selfishness and the need to survive and belong, the need to form bonds, makes for the strongest narrative impetus of “Children of the Fall”, one enhanced by the post-apocalyptic backdrop in stark lines. And yet, in a puzzling manner, the collective of players, of characters in a game focused on collective narration…is not an entity. Does not matter, apart from the relation in which the individual characters are situated within it. Let me give you a couple of examples: What about taboos and violating them? If, for example, a player character is caught violating one, that could present an interesting angle that could have, temporarily, repercussions, like a loss of determination or helix points. Perhaps, a character is caught by another, and must decide on whether to silence or intimidate the character that caught them? Perhaps, a majority-vote of the tribe could take away a helix point or add a determination point for tasks? Perhaps being afraid or scared of another member would make it impossible to do certain things? With a bit more “engine”, the narrative aspects could be vastly enhanced here. Let’s say there is a pool called “tribe points” – this pool can be accessed collectively and spent like Determination or Helix points – but the pool is contingent on the cohesion of the tribe. Helping a fellow PC, saving someone, defeating a threat – the like could provide a tribe pool. Every member would then be allowed to spend the point in whatever way a situation demands it. This simple addition would provide a simple reward mechanism for the act of springing complications upon fellow players. Instead of being annoyed by a complication and getting a zero-sum point shifted around, it would be a *chance. * Every obstacle and danger faced would be a way to get another point that can help yourself…and all your friends. This makes getting into danger actually something to be glad about. So yeah, for me the most interesting angle here definitely was how the group dynamics of children would interact in a post-apocalypse. And that… falls by the wayside. Don’t get me wrong: This is good to depict a post-apocalyptic frame-work. Not a setting, not setting-guidelines, a very basic framework. But it is this attempt of being all-encompassing, of never settling on a theme, that makes the whole “children”-angle fall flat. The concerns of children differ from ours, and as presented, the player characters are defined by archetypes that could just as well be grafted onto adults. The martyr sheet, for example, notes for traumas and downfall: “Reason to fight; Fear takes over; Self-sacrifice for a cause.” The character questions, similarly, don’t reflect a particularly childish point of view. The whole “children”-angle is a very thin coating that easily comes off under scrutiny. I maintain that the tribe as a kind of ersatz-family in the absence of wholesome adults could have provided a vastly more engaging and rewarding narrative tool for a story game, one that could have helped develop this somewhat underdeveloped aspect of the game. Which brings me to my verdict: “Children of the Fall” will not convert anyone, but it doesn’t have to. It’s a story game, and a soli, very basic skeleton to develop your narrative upon. It does its job as a facilitator of a collective narrative experience well, and it offers some nice options. However, it also never transcends being a very basic toolkit, a skeleton without any meat on its bones, for your narrative. Any dressing and conflict resolution between different visions need to be tackled by the group. To reiterate: As a story game’s starting point, it works. However, as a *specific* story game about kids in a post-apocalyptic context? Well, there it falls utterly flat of what the premise deserves. This is not a bad game by any stretch, and I certainly wished I could have rated it higher. For me, as a person, this did nothing – I could have whipped out a more complex base engine on the fly, and where I would have needed both a narrative baseline or inspiration regarding the kids-angle, I got none. If you’re looking for more than a baseline to craft stories from, then consider this a 2-star dud. To reiterate: I get what this tries to do. I just don’t think it’s particularly successful at what it attempts. However, as a reviewer, I am going to rate this on the premise that this, to me somewhat bland generic nature, is actually intended to provide the maximum flexibility for groups to explore. I wanted to like this more than I ended up doing…but with the slight formal tarnishes and those missed chances for deeper immersion and narrative facilitators, I can’t rate this higher than 3 stars. You can get this story game here on OBS. This module clocks in at 35 pages, 1 page front cover, 1 page inside of front cover, 1 page editorial, 1 page ToC, 1 page SRD, 1 page back cover, leaving us with 30 pages of content, so let’s take a look! This review was moved up in my review-queue as a prioritized review at the request of my patreons….ah, who am I kidding? After the absolutely superb Pixies on Parade, I would have covered this as fast as possible even without that. Speaking of which – I strongly suggest playing Pixies on Parade before this one. While it can stand alone easily, I do believe that it has an added sense of gravitas when played as a kind of sequel – the pdf makes use of the concept of imagination magic and the inclusion of the dream-like logics should make pretty clear that yes, this will have an excellent reason for championing a thus more mutable reality. With the dream realm overlaps featured within, we get really nice global rules that set adventuring in the realm of dreams apart from mundane adventures – the mutable nature allows for unique tactical decisions, hijacking of specific dreams and the like. It is a truly distinct playing experience that thankfully has been translated in a tight and concise manner to 5e. Now, this is obviously a conversion of the original module released for PFRPG; usually, that would have me worried…particularly considering how good the original was. In case you missed it: “Nightmares on Parade” made the #1 spot of my Top Ten the year it was released. Translating that level of excellence is an extremely tough task. So, can the 5e-version hold up to the PFRPG version’s excellence? …and this is as far as I can go without SPOILING anything. Potential players SHOULD jump to the conclusion. This also includes some SPOILERS for the prequel, “Pixies on Parade”, so please don’t read on if you want to play them. They’re worth it. In “Pixies on Parade”, the PCs have managed to save Edwin from the clutches and malign influence exerted over him by the Nightmare King. He may not be escaping anytime soon…but he does not sit idly by, instead using his considerable power to draw the picturesque village of Glavost right into his nightmare realm! Uniquely empowered by their experiences in “Pixies on Parade”, the PCs thus receive the ability to manipulate reality – wishing for a unicorn, for example, may actually manifest one – though the created dreams generated do not feature the abilities of the things they’re modeled after, instead employing the lesser dream statblock included within. Indeed, the somewhat parasitic/dependant nature of these dreams allows people tied to them to shape them. Anyways, the module begins with an ominous darkening sky, a quake and mists drawing in – if your PCs have gone through the gauntlet of Ravenloft at one point, that alone will make them paranoid as all hell. Aforementioned dreams seek out the PCs and bond with them. As the PCs walk outside, they will notice Belle Leaflower walking the streets, unable to communicate or, well, perceive anybody – creative problem solution is the name of the game, as her anxieties manifest themselves and thus influence the next encounter, namely saving the ancient Elas Leaflower, who is obsessively trying to read as many books as possible at once, fearing that he is running out of time – and if the long beard and constantly multiplying books (which do not take kindly to intruders!) are any indicator, he’d be right. The PCs will have to contend with falling bookshelves, book swarms and find a way to convince Elas that his quest his futile, his books, as they are wont to be in dreams, but gibberish. This would be a kind of leitmotif to be found here – the Nightmare King has provided some delightfully twisted (and goofy) nightmares for the folks of Glavost: Dwarven chef Rus Ulden is hunted by jello-oozing killer cupcakes. And yes, you can actually eat these…which makes for a cool prop when fighting them…just as a note… Each fellow saved and encounter passed provided an inspiration as a reward – a reward the PCs will really need, but more on that later. Beyond these detailed encounters, however, there are also more simple, optional ones provided for your convenience: The more invested the PCs are in Glavost, the better. The fight for the minds and imagination of Glavost takes the PCs, ultimately, to the major’s house, where a semi-solid sheathe of darkness covers everything and Edwin needs to be saved from what seems to be the nightmare king…though it is, in fact, “only” the most powerful dream plaguing Glavost. Having defeated this threat, the PCs now will have the proper power of a town’s imagination backing them up, namely in the ability to duplicate mirage arcane as an innate spell-like ability…except that, here in the realm of dreams, these illusions are real. Kind of. They don’t cause damage per se to most beings…but they fully affect lesser dreams! This is super important for the adventure. But the Nightmare King is not just going to throw in the towel because he’s been foiled here – instead, he figures he might as well go big or go home…and sends a frickin’ army in the direction of the PCs. And this is where the plot thickens and parents and adults alike should take a good, long look: The kids of Glavost, while considered to be “heroes”, were basically treated with condescension by the adults; as kids all across the globe are wont to be; one crucial and important lesson anyone can draw from this book and project to the real world is that kids deserve respect. In real life, kids may not create phantom armies…but that doesn’t mean that they can’t save the lives of others, that they may not be the triumphant factor in the battle for the hearts and minds of the adults around them. Just something to figure – kids are not property, they are people we accompany for some time along the way, that we try to help prosper and hopefully leave the world a better place for…but I digress. The PCs have saved the adults and so, they may shore up the defenses and use their imagination to save the town with offenses and defenses created. There may a saboteur in their midst – the teenage night hag Isabeth, who proceeds to trap the PCs and request them doing horrible, annoying chores – but they will have to do them, if they are to escape…and there’s a way to befriend Isabeth in the process, which may well be used as a means to teach kids how to deal with folks (like elder siblings…) in puberty…but that just as an aside. The module continues to “teach”, if you will, life lessons while being played – there is a detention scenario next, where the PCs are targeted by suggestions and the gremlins running the show try to get them to acknowledge that they should not be brave etc. – the idea here is simple, yet brilliant: It is mathematically unlikely that all PCs fail the save (though such a scenario is accounted for as well), and thus, the PCs will have the chance to rebuttal the theses thrown at them, with grudging acknowledgement from the gremlins….but, of course, the more PCs fail, the more will they be forced to reply as per the wishes of the “teacher”. This is something that the current generations definitely should take to heart: My experience with the younger kids is that, more often than not, they are taught to cave to peer pressure, to maintain a “pleasant” environment with their comrades, even if goes against their beliefs and convictions – when I compare my cousin’s school experience to mine, for example, we have been horribly rowdies and rebels who stood up for what we believed in, whereas my cousins tend to just assume the path of least resistance, modifying their convictions due to fear of being ostracized. I think that kids should be taught, as soon as possible, that their convictions have value and that the majority is not always right. This encounter does just that, without jamming its message down one’s throat. It’s also creative regarding how the rules are presented for 5e, so yeah – amazing! Next up would be yet another interesting one – a satyr skald offers the PCs a fair deal: He was tasked to delay them, but finds this strategy distasteful and thus offers to fill the PCs in one the background story of the Nightmare King, which is provided in lavish detail – it is here that the old truism of knowledge equaling power may be taught…and the respectful demeanor and no-strings, straightforward and respectful attitude of the satyr progresses the thematic sequence of being show proper respect for one’s achievements. The sequence here is important: This “lesson” comes right after the one that teaches to not cave to peer pressure and authority. It emphasizes that knowledge deserves respect, and that accumulating knowledge can make resistance to the opinion of the majority valid, justified. Once the PCs have heard the story (or left of their own free will), it will be time for the army of Glavost’s dreams to duke it out with the servants of the Nightmare King! Here, things become once again amazing, as, while the module recommends a descriptive and flavor-centric take on the battle of the armies, groups that enjoy rules-intense scenarios can employ the easy and quick to implement mass combat rules provided here! Yup, statblocks for the armies are provided. I intentionally did not write “kids will use descriptive, adults the rules”, mind you – I certainly know enough young ones that are REALLY into the nit and grit of rules! The amazing thing here is that the PCs may use their imagination to greatly influence the way the battle works: Mass imagination magic, flexible benefits – if properly employed, this is frickin’ amazing indeed! For 5e, it also offers something I enjoy: For the fellows that prefer the rules lite side of things, the descriptive option works; for those that enjoy the tactical side more, it’s here as well – basically, an everyone wins scenario. Returning to the theme of respect – as the nightmare armies crumble, Behast, the Nightmare King waltzes to the PCs and actually offers an imagination duel; a scenario wherein he creates obstacles with his power for the PCs to overcome…an usually a respectful way of solving conflict sans violence amidst otherwise immortal beings. Having even the BBEG actually treat the PCs with respect is a truly amazing progression of the themes employed in this book. Speaking of amazing: The PC’s actions throughout the module have direct consequences here – Behast may not enter the fray directly, but his champion has several abilities, each of which is tied to one specific type of action the PCs may have done…the better they treated their fellows, the more they helped them, the bigger are their chances against Behast’s champion! Know, how in those cool 80s/90s kid’s movies at one point, the kids would combine their powers, reap the benefits of the good deeds they have sown previously? It may be a bit cheesy, but it always put a good kind of shiver down my spine. Oh, and don’t tell anyone, since the PCs have to find out the hard way…but don’t worry about player frustration in this book – a sidebar’s got you covered, and the book provides guidance time and again. Editing and formatting are very good – with the exception of a very minor aesthetic hiccup at one point, the book is pretty flawless. Layout adheres to a beautiful two-column full-color standard with a turquoise background. This may not make it too printer-friendly, but I’d suggest getting this in print anyway. The artwork adheres to Jacob Blackmon’s comic-like style and is nice and internally consistent. The pdf comes fully bookmarked for your convenience. Apart from a darker map of Glavost, the pdf lacks precise maps, but considering the morphic theme and mutable nature of the surroundings in every encounter, it does not need them; I was a bit skeptical regarding this component, but actual playtest did affirm that the module works smoothly. Stephen Rowe has been a kind of anomaly among RPG-designers in that he’s equally at home in the writing of crunch and fluff. Additionally, his modules so far have not failed to impress me, with both Pixies on Parade or Directive Infinity X being examples of excellence. Nightmares on Parade is a whole different level, and it is to my utmost pleasure that I can state that this holds true for 5e as well. Let me elaborate a bit: Playground Adventures generally provides modules that can help educate kids, teach concepts and knowledge in a manner that is not obtrusive, in a manner that is fun. Pixies on Parade was a pretty much perfect homage to 80s’ kid’s movies – you know, when we still treated kids as proper beings, not as second-class citizens to be sheltered to the point of generating narcissists, to the point where they’re not ready facing a reality that does not cuddle them all the way. Pixies was brilliant in that it provided a scenario that dipped into creepy themes, but at the same time maintained a child-friendly levity in theme and execution. Oh, and in the hands of an even remotely capable GM, you could run it as a balls-to-the-wall horror/dark fantasy module. Think of a certain Goblin King’s labyrinth, think of the last member of an equine, horned species and you’ll see what I mean: Watching these movies as a child delighted me; watching them as an adult provided a wholly different context for both. Pixies did that and did it perfectly. Age-wise, all but the most sensitive of kids should be good with it and I ran it for a then-4-year-old sans issues. The target demographic, though, should be about ages 6+, for really, really sensitive kids probably 8+. It always depends on the kid in question. “Nightmares on Parade” is the successor in that theme in more ways than one, maintaining the leitmotifs…but also presenting a dimension that far exceeds what regular modules offer, what you can witness in any of its predecessors. What do I mean by this? I have to wax poetically a bit here: The German concept of “Bildung” denotes the collective process of education and personality-formation, including a development of one’s own personal ideology, convictions, etc. – the very word generates an association with building one’s self as an eternal process, of describing the totality of construction work of your own personality and accumulated knowledge in all fields of life. There is exactly one other module, Richard Develyn’s brilliant “Seven Sinful Tales”, which has ever made me employ this word in the context of adventures you can run. There is not a single encounter in this module that does not provide, in unobtrusive subtext, a truly valuable, morally and ethically valuable lesson. And this does not only extend to kids: Parents running this module for their kids should carefully read this module and analyze it, for the aforementioned leitmotif of respecting your child, the importance of that aspect for the development of adults and the way in which this module treats kids can, in my most deeply-held convictions, potentially improve the horizon of parents alike. The theme of respect that ultimately is awarded to the PCs and their players by the BBEG culminates in a glorious experience that may well, in some cases, end night troubles…after all, the nightmare king has conceded defeat. But that as just an aside. Beyond these psychologically relevant aspects and the wonderful, respectful way this book treats its audience, regardless of age, one should not be remiss to emphasize the downright amazing use of imagination magic throughout the book and the fact that, beyond the glorious lessons imparted herein, it ALSO is a truly amazing module. Whether or not you go mass combat, whether or not you play this as horror (Concerned parents, rest assured that this module, as written, is as wholesome as it gets…but any only semi-decent GM can make this very dark very easily and basically transform it on the fly into a horror-module just by adding non-kid-friendly dressing!) for adults, as a kid-friendly adventure as written, as emphasizing the crunchy aspects or de-emphasizing them via Imagination Magic, you retain maximum flexibility in how you actually run the module. I’ve run this twice and both times in radically different manners – and in both cases, the structure held up: The kid-friendly run worked as amazing as expected, replacing Pixies as their favorite module. The experience of running this as an adult module with my own trademark tweaks went over just as well. Ultimately, “Nightmares of Parade” may be a glorious module on its own…but its value lies beyond that. It is a module that not only dares to teach in a didactically unobtrusive manner, it is one that teaches in a tailor-made, carefully and in truly intelligent way, to leave particularly kids and parents as better persons for having played it. If you think I’m overanalyzing this, btw., then I’d point you straight towards the fact that this obviously is intended to achieve said stated goal; each and every facet of the module is devoted towards cultivating a respectful and benevolent development, a component of “Bildung” not only between the players, but also in their interaction with others and amongst themselves. It teaches spine and courage in the face of adversity and the value of behaving in an upstanding, honorable manner while still being kids. 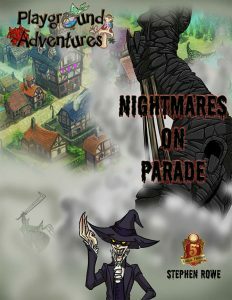 In short: Nightmares on Parade is a masterpiece not only on a formal level, but also is one of the scant few modules that dares to try to leave its audience better off for having played it; it is one of the very few incarnations of our favorite medium that tries to do more than entertain, without losing sight of entertainment being the primary purpose. Stephen Rowe has surpassed himself with this module and catapulted himself into a level of adventure-writing excellence that is rarefied indeed, that is a very small class of its own. With all my heart, I encourage you to get Pixies and this, the sequel. We need authors that dare to do more than just entertain (though it certainly does excel here as well! ); it is my firm conviction that roleplaying games already are a great way of helping people, regardless of age, connect, develop and improve in numerous aspects of life. This, however, takes everything one step further – it can actually be seen as a module that could be canon as something that truly benefits everyone involved, that helps form personalities and strengthen positive character traits. This is Bildung given the form of an exceedingly fun and modular adventure. This humble masterpiece is worth 5 stars + seal of approval and the 5e-version loses, thankfully, nothing of the splendor of the original, making this on par with my #1 of my Top Ten of 2016! If you share my firm belief that roleplaying games can make us all better people…then take a look. This module, frankly, is art in the most unpretentious manner you can define it; it leaves you better for having witnessed it. You can get a related map folio for PWYW here! Missed Pixies on Parade? You can find that one here on OBS! This Everyman Mini clocks in at 11 pages, 1 page front cover, 1 page editorial, 5 pages of SRD, 1 page advertisement, leaving us with3 pages of content, so let’s take a look! 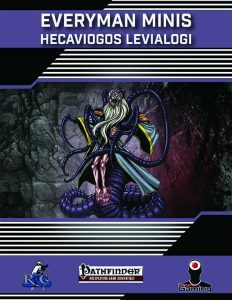 So, in case you’re wondering what the levialogi (singular levialogos) are: They are a new creature subtype introduced originally in Paranormal Adventures, originally inspired in a loose manner by the Leviathans from the Supernatural TV-series. However, they are really loosely inspired by them and imho surpassed the source material in that they had a more distinct identity. There is another aspect to them that renders them remarkable. I a game as offense-focused as PFRPG, they withstand. They endure. They don’t immediately fall apart when confronted with a properly optimized group. Levialogi are both DEADLY and incredibly resilient, making your high-level PCs actually work for once if they want to have even a remote chance of taking one of these fellows down. Add to that great fluff, and we have perhaps my favorite component of the whole Paranormal Adventures book. They are awesome and singular among monsters, in a way that very few types of subtypes are, with perhaps only kaiju and troops having this significant an impact on the base creature. Okay, add 5 attacks and we also have a nice offense, but where the fellow becomes truly unique is with the mass conversion ability: The hit of a tendril can suspend aging for a year, penalize saves, cause Dex drain, modify memory, major curse…and those are the general tricks. If you own (you should!) the amazing Childhood Adventures or Microsized Adventures supplements, you’ll get two more tricks out of the fellow: For synergy with the former, we have age category manipulation, for the former, we have microsizing targets…oh, and the hecaviogos can also inflict all of that with its gaze. Did I mention the massive array of SPs? Or that, when it possesses someone, it can supersede the target’s body with its own? The massive flavor text that further explains these horrific twisters of flesh just adds the final flourish to a pdf that oozes the level of panache I expected to find here. Editing and formatting re top-notch, I noticed no hiccups. Layout adheres to the new two-column full-color standard of the Everyman Minis-series, and the artwork for the fellow is really cool! The pdf has no bookmarks, but needs none at this length. Alexander Augunas had a tough job here: I usually end up as disappointed when I have expectations that are this high for a critter. Not so here. With grace and panache aplomb, the author delivers one nigh-unstoppable nightmare that can challenge the most stalwart of groups when played properly. This critter is a perfect example of what can happen when you emphasize quality over quantity, offering a level of coolness only rarely seen in creatures. This gets a final verdict of 5 stars + seal of approval, awarded without any hesitation. Want more of these deadly beasts, but missed Paranormal Adventures? The book is right here! 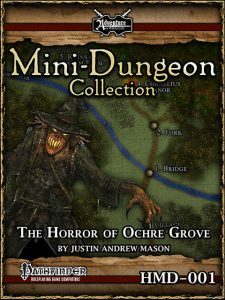 The excellent Microsized Adventures can be found here! The similarly impressive Childhood Adventures book can be found here! The second of the 1-on-1 adventure modules that can act as an optional introduction to Curse of the Crimson Throne clocks in at 48 pages, 1 page front cover, 1 page inside of front cover, 1 page editorial, 2 pages of introduction, 1 page ToC, 2 pages of SRD, 1 page advertisement, 1 page back cover, leaving us with a total of 38 pages of content, so let’s take a look! This review was moved up in my queue at the request of one of my patreons. Full Disclosure: I have received this adventure some time ago for the purpose of a fair and unbiased review. Since then, I have accepted the position as lead developer for Legendary Games. I have no stake in this product’s success or lack thereof, as it predates me accepting this position, and I have not worked on it in any capacity, shape, way or form. Well, first things first: This can be run as a direct sequel to the excellent “Orphans of the Hanged Man”, but it does not necessarily require that you have finished its prequel. The module does come with a full and proper array of player-friendly full-color maps. It is intended for a character of 2nd level, and the adventure comes with a new CR 1 monster, the scroll sentinel,, which is an excellent example for how damn good Legendary Games’ monster design continues to be: The creature has a cool Achilles’ hell and several unique abilities – and it does come with its own illustration. Rather cool!! A pregen is also included in the deal. This being an adventure-review, the following contains copious amounts of SPOILERS. Potential players should jump ahead to the conclusion. All right, only GMs around? Great! So, the old master thief, alas, finally passes away from old age; however, the Pc being his heir of sorts, does receive a letter that passes the valuable city properties one alias of the Hanged Man had, to the PC. A trip to a helpful forger later, and the PC only has a simple task ahead – slipping these forgeries into the city archives! The set-up for the region where the archives are located is pretty nice, providing benefits and notes for PCs doing their proper legwork casing the joint. No less than 6 (!!!) means of ingress are provided with notes on the checks and things required to get in, and the staff is similarly associated in detail with the default NPC arrays. The vault itself is also impressive, for example regarding monster choice: Pyraustas can be found (though the color of the letters of their header is black when it should be white in one of the rare formatting glitches), a bronze asp (fully statted, templated iron cobra) – and traps. All of these have something in common that I hope to see in PF 2, when it comes, more often: They can be resolved via ROLEplaying, not just by rolling the dice; indeed, that’s the preferred method! The bronze asp has a particular program that allows for full bypassing, the traps can be turned off or avoided by clever PCs – brute-forcing is always possible, yes, but it’s so much more rewarding to do this the clever way. This heist, by the way, is only the first part of this adventure! Having secured the inheritance, the PC gets an offer from aforementioned forger to building a smuggler’s network – once more, clever observation, with degrees of success and various different means, allows the PCs to recruit, in one way or another, a variety of colorful characters – by free will or coercion. A ragpicker savant ghoststory teller, grindylows (good if you treated them well in Oprhans…), a philandering customs agent and more all can be found – this is basically a “getting the gang together” type of scenario. However, things don’t end with the smuggling operation – a rival, a very powerful foe, Jaylin Rinegold, has the warehouse seized…and the last man to cross Ms. Rinegold did not fare well. Some inquiries will point the PC to an alchemist, and then, well, it’ll take the application of both the short-lived alchemical brews, marker dye to counter invisible threats, and the skills acquired so far to make it through Rinegold’s mansion: A schedule and reconnaissance details are included, and a guards and wards spells that confuses targets, shrouds doors and cloaks the hallways in mist makes for a super-exciting high-stakes infiltration. Arcane locked doors and those covered by illusions are appropriately noted with glyphs on the GM map for easy and convenient reference. The hands of the former thief that informed the PC btw. still tip toe as crawling claws through the house, making for an interesting souvenir for the poor man. The infiltration here is not piece of cake – the final boss may *just* be an imp (convenient silver provided nearby…), but a final and pretty challenging effect of the global enchantment can have important information slip through the PC’s grasp…and here, the ministerial seal can be found, allowing for the end of the blockade of all those delightful goods, ending the module with the PC having established themselves as a force to be reckoned with. Editing and formatting are very good on a formal and rules-language level, I noticed no serious hiccups. Layout adheres to the two-column full-color standard of the Curse of the Crimson Throne plugins, and the pdf comes with nice full-color artworks. The cartography is in full-color as well and features player-friendly versions – big plus! The adventure comes fully bookmarked for your convenience. 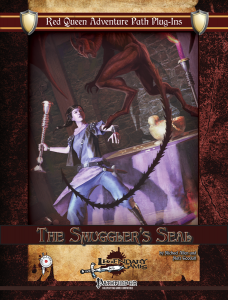 Michael Allen and Matt Goodall provide a glorious one-on-one adventure in this offering: “The Smuggler’s Seal” continues to teach the PC to be smart, observant and provides for plenty of different solutions for the problems faced. The learning process is palpable, and the adventure covers a surprising amount of ground, offering more bang for your buck than you’d imagine. I estimate that this could cover up to 8 or 10 full sessions if you take your time with roleplaying conversations, and few players will finish it in under 4 sessions. This has a ton of material to offer and does the heist genre and its various tropes exceedingly well. So well, in fact, that I really wish for the style to continue. It’s not just the challenges or details – it’s the freedom to tackle problems in different ways, the rewarding of roleplaying over simple good die-rolls, that makes this so fun and exciting. This is a worthy sequel to the excellent predecessor and probably manages to exceed its appeal even. If you’re looking for an excellent heist-y module, look not further! As an aside, while it may require lower level PCs and some tinkering with the challenges, I can see this warrant being used for a group as well. It’s that interesting. This receives 5 stars + seal of approval. You can get this amazing 1-on-1-adventure here on OBS! Missed “Orphans of the Hanged Man”? You can find it here on OBS!